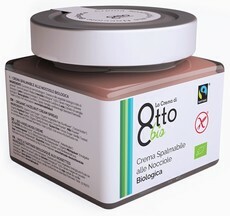 The only and one hazelnuts cream combining three certifications guarantees: organic, fairtrade and gluten free. Our organic trinitarian cocoa’s flavour matches the delicate italian hazelnuts’scent, leaving a pleasing sense of fulfillment and sweetness. Totally free from palm oil, is enriched, instead, by organic refined and cold pressed sunflower oil. The use of the highest quality ingredients, results in a cream characterized by an intense flavour.